I had to laugh that you were stumped over your own question! I live in Florida and think our sunsets are gorgeous! There's nothing quite like watching the sun go down over the water!! 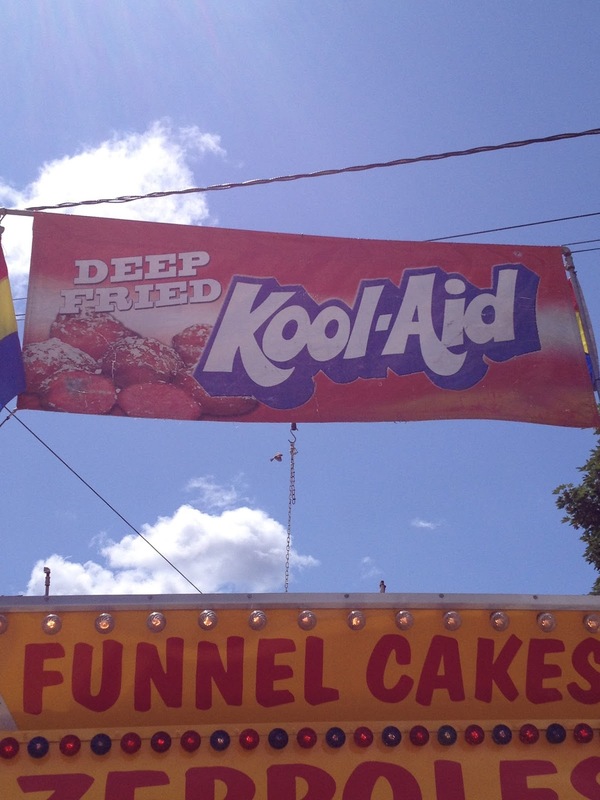 I have never seen deep-fried Koolaid. I have had deep-fried ice cream though and it was delicious. Yes! Of course the dishwasher counts! :) I love the sunset picture. They're fun to sit out on the deck and watch on a warm night. Haha! I love your seven worded sentence Joyce - made me giggle! Love the picture of your girls watching the sunset! I have the recipe for fried koolaid. It's basically a donut dough flavored with koolaid. Not at all what I had expected when I first heard of it a year or so ago. I wish you would have tried the fried Kool-Aid so you could tell us about it. I think any sunrise or sunset over the ocean is beautiful. Plan to see a few of those sunrises in November. Fried Kool-aid, never heard of such and wonder what Google might have to say about it? Doesn't sound the least bit enticing to me. I'll have to connect with you on Instagram. 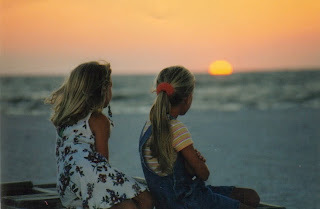 Love the picture of the girlies looking at the sunset. How sweet! I imagine they use the powder in the batter? .. .maybe like a hushpuppy? I log in pretty early - around 7am... & there are already like 15 people that have added their links... how do people get them in that early... lots of early birds around here! I alternate the time I post the link to try to give everyone 'equal opportunity' : ) This week I posted the link at 12:01 so some of the early birds are actually west coasters or east coast night owls. Last week I set the link to post at 4 am which means the east coasters are generally first on the link up. I enjoyed reading your answers. It seems you've had the opportunity to visit many places in your life, what a blessing! About the Kool Aid thing - sugar and artificial color, why would I want to try it in any form? I saw another commenter say something about a type of doughnut, that makes sense. Deep fried=the fair. Ahhh, loading the dishwasher, I have that skill too. I wish I could earn some money doing what I do well! I like your 7 word year answer, very appropriate for you! Would love to join you at Harry's Bar! I guess I could agree with loading the dishwasher, I'm pretty good at that. I always forget to go to Instagram except for when I have a photo to share. I must try harder! State Fairs can be fun. I like to go every few years. Have not tried the Kool-Aid but have tried several other fried things. I do love the funnel cakes, always a favorite. I love going to state fair's, but I stay away from the food. It is good, but means an extra week on the treadmill. Great questions! Each week I enjoy reading Lea's answers to your questions on Cici's Corner. So today I decided to join in. Great questions this week. Very thought provoking. My guess is that they make the koolaid, freeze it, then put a batter around it to deep fry. That's how they deep fry butter. I know this only because I saw it on a show about the fried foods at the Texas state fair. It's funny to me how they always find new things to fry at state fairs!! I would never had imagined Koolaid! I feel like I am way behind in everything. I leave on Friday to go and see my Mom for the last time. Makes me just weep. I like to rearrange the dishwasher too. Which is why I have always done the dishes. Saves time. Ha. I'm totally stumped on the fried koolaid. Weird. I mean, what next...fried champagne?! ha ha. They deep fry everything at the state fair. Bacon, butter, snickers, pickles...pretty sure you can deep fry about anything and serve it up as a treat. Did you try it? Yuk, deep fried Kool-aid? Maybe they coat something with it? Now I'm curious. I wish I had a smart phone so I could get on board Instagram. Hey Joyce! Miss you and the Hodgepodge. But I decided blogging had to step back while I work full time again. Just stopping in, since I found some free time to read. I'm glad to see you are enjoying your summer. Too soon winter will come again. Hugs, and blessings to you and your family! !